Look for thicker nacho chips or nacho chip scoops that won’t easily break when scooping out the dip. 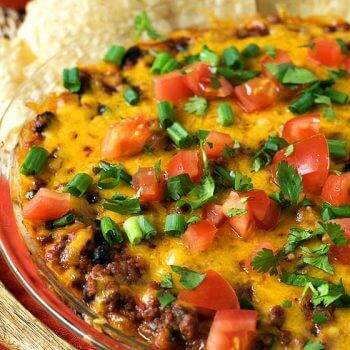 The thin ones are good with queso but for a hearty thick dip like this, you need a sturdy chip!. In a standard glass pie plate or the baking dish of your choice, place the cold cream cheese and with the back of a soup spoon, spread evenly to sides. Bake uncovered for 20 minutes. Remove from oven and sprinkle top with drained diced tomato, cilantro and sliced scallion tops. Serve with nacho chips and be prepared to get another one in the oven because the first one will be gone before you ever get a chance to turn the oven off.